Little Notes from Kata Golda: Behind the Scenes: "Tooth Fairy Keepsake" & "Stories for Bedtime"
Behind the Scenes: "Tooth Fairy Keepsake" & "Stories for Bedtime"
For quite sometime I've been anticipating the publication of two children's book projects I've been working on with Chronicle Books — Stories for Bedtime and Tooth Fairy Keepsake — and their April 2011 release date is now right around the corner! I first wrote about these books back in June 2010, which seems like ages ago, but even then we were quite far along in the process. In a time where technology so easily grants us instant gratification, it's easy to forget how much time and energy it takes to make a book. Even my close friends were shocked to learn that these were projects I'd started well over a year ago, and so I thought I'd share some more insight into how these books came to be. 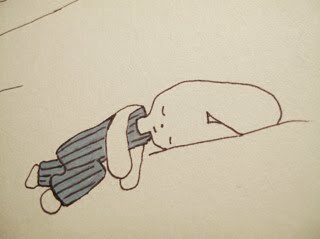 I began both projects by researching — which meant lots of trips to the library. For Tooth Fairy Keepsake I did a lot of digging into the history the tooth fairy and the traditions that center around it. Children often use tooth fairy pillows to store a newly lost tooth, which are then placed on their bed before going to sleep—in hopes that the tooth fairy will come claim it during the night, leaving a small gift in exchange. Wanting to create a new variation on that — and needing to keep within constraints of a book project — I thought a lot about what both a parent and child would want to record about losing teeth, and how to honor that in a way that was meaningful to both. 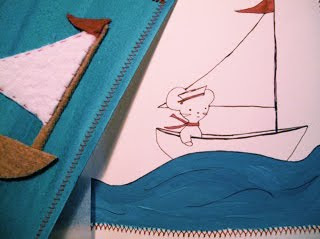 I decided that creating a felt pocket that could not only hold the tooth, but also a record keeping book, would be a meaningful way to remember such a milestone in a child's development. 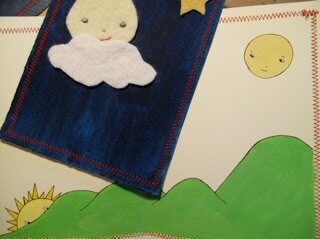 The idea of a felt pocket as container carried across into Stories for Bedtime, which is a felt pocket containing cards with bedtime-related stories on them. 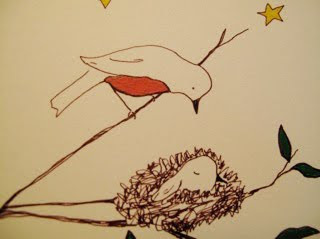 In choosing these stories I read a lot of old poetry written for children, reading very critically and slowly, giving me the opportunity to make connections to my own childhood with my daughter's. 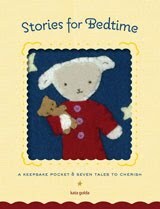 As I read and re-read the stories and poems, I set aside those that were both unique and meaningful, jotting down ideas about ways to make the act of bedtime story reading an engaging pastime — especially for children who are not yet old enough to read on their own. As a result each of the story cards has a list of questions to ask the child to help them think about the story they just heard, as well as a place to record the answers. Once the ideas and text were settled on, it was time to pull out the pencils, paper, scissors, felt and thread and begin to create. My creative hand was truly in this: mixing paint, cutting shapes (in paper and felt), drawing with a fine pointed black pen, and stitching together felt and adding little touches with thread. I took photographs of my progress, and it's comforting for me to have this visual record — the final product looks so polished and perfect that even I forget that this step of the process started with using water color paint and cutting out irregular yellow stars from paper. 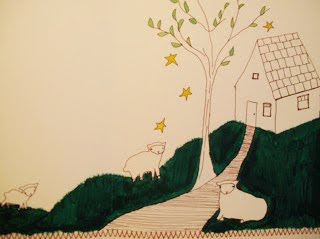 [ABOVE] Early sketches and mock-ups for Stories for Bedtime. I enjoyed the process every step of the way, from the initial idea and hours spent with my nose in books to making rough sketches (on white paper with a sharp #2 pencil) and then later the final adjustments (slightly tweaking facial expressions, and little stitch changes — lots of little stitch changes). I'll share more about these books as April draws closer. 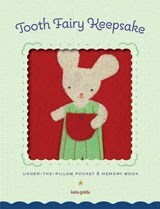 In the meantime you can pre-order Tooth Fairy Keepsake and Stories for Bedtime through Chronicle Books, where you can also sign up to get notified via email when they become available on shelves. 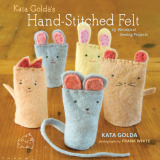 Stuffed Bunny Companion (6 pm – 9 pm) :: Learn how to make a plush bunny toy from felt with artist and author Kata Golda at Marigold & Mint. Register by calling (206) 682-3111. Easter Egg Basket & Chick (10 am – 1:30 pm) :: Learn how to make an Easter basket and a wee egg-shaped chick from felt with artist and author Kata Golda at Modern Domestic. Register for class. Stuffed Bunny Companion (2:30 pm – 6 pm) :: Learn how to make a plush bunny toy from felt with artist and author Kata Golda at Modern Domestic. Register for class.